The Swedish Air Force is using laser-guided bombs to snuff out forest fires with blast waves, which (apparently) is similar to “blowing out candles on a birthday cake“. In related news: there are no words to describe the wildfire horror in Greece; arson is suspected as the source of forest fires east of LA; and BC’s air quality woes come from wildfires as far away as Siberia. In Forestry news: NASA says mega fires in Canada’s north released half as much carbon as Canada typically stores in a year; the NRDC says the survival of the planet depends on Canada’s boreal forest; and a UK study says tropical forests may soon become a source rather than sink for greenhouse gases. Finally, depending on your point of view: US tariffs are impacting home prices (in New York State); bad for homebuyers (in general); good for US sawmills (in Maine); or not a problem in the short term (per CN Rail). Any doubt that B.C. 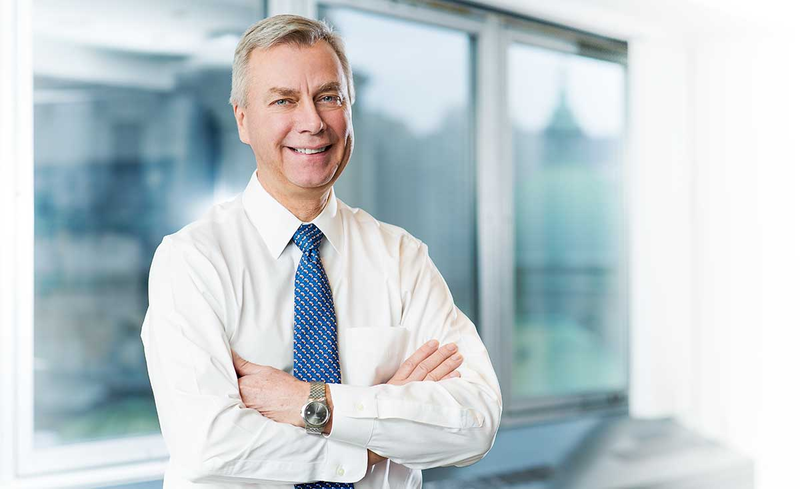 has a thriving mining and metals sector can be dispelled by a glance at Business in Vancouver’s list of the Top 100 Highest-Paid Executives in B.C. Executives who work for companies in the mining and metals sector nabbed 44 spots on the list. Add in the seven execs who work for companies that are in the oil and gas industry, and the four who are in the forest-products sector, and more than half of all listed top decision-makers work at companies in resources-related fields. “We say all the time that B.C. is a world-class mining jurisdiction,” said Bryan Cox, CEO of the Mining Association of BC. “We are a hub for mining. It shows in those numbers.” …Forestry-sector CEOs at West Fraser Timber, Interfor, Canfor and Western Forest Products also claim spots on the list. VANCOUVER – Canfor says it paid $51.7 million in countervailing duties in the second quarter, the result of U.S. tariffs that went into force in 2017. Canfor, which sells more than half of its lumber to the U.S., reported operating income of $282.1 million for the second quarter of 2018, up $78.3 million from the first quarter, with the increase reflecting significantly higher lumber segment operating earnings as well as growing pulp sales. Canfor says it paid a net duty expense of $51.7 million… compared to $34.9 million in the first quarter of 2018 and $35.6 million in the second quarter of 2017. After adjusting for duties, operating income was $333.8 million for the second quarter of 2018, up $95.1 million from similarly adjusted operating income in the first quarter of 2018. …Canfor plans to build a $120 million, state-of-the-art softwood lumber sawmill in Washington, Georgia, with a production capacity of 275 million board feet. If Americans didn’t face enough of a challenge buying a home as housing prices increase and interest rates rise, here’s another: tariffs. The Trump administration’s levies on a range of imports, along with retaliatory moves by U.S. trading partners, are raising the costs of homeownership. Here’s how: Lumber prices have soared nearly 30 percent in the last year due to U.S. tariffs on Canadian wood, as well as supply shortages due to wildfires. …The price of washing machines in the U.S. has jumped an average of nearly 20 percent since last year, according to federal data. Most of that is due to tariffs. …Renewable energy systems may be more expensive, as solar panel prices increase. …Storm shutters in some regions are seeing price hikes. WASHINGTON — Sales of new U.S. homes tumbled 5.3 percent in June and the median sales price also slipped, a potentially ominous sign for the U.S. housing market. The Commerce Department said Wednesday that newly built homes sold at a seasonally adjusted annual rate of 631,000 last month, less than May’s revised figure of 666,000. The decline follows solid growth in previous months. New-home sales have risen 6.9 percent so far this year, but builders are starting to wrestle with rising costs for lumber. At the same time, mortgage rates are on the rise and wage growth has been meager, squeezing many would-be buyers. 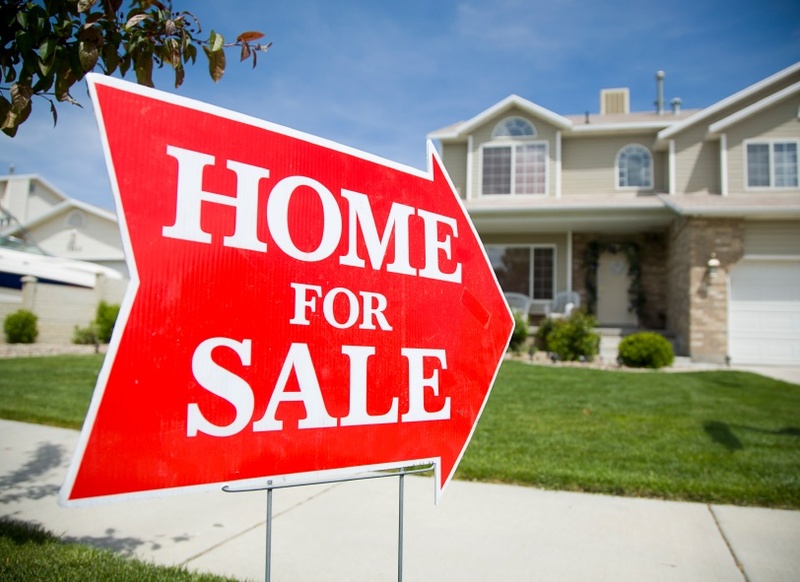 “Weak June new home sales add more evidence that the housing market is flattening, and may have peaked for this expansion,” said Robert Frick, a corporate economist for Navy Federal Credit Union. If you’ve been considering building a new home or putting on an addition you may want to act fast; lumber prices are skyrocketing. While the housing market in the Rochester region has been steady, these major increases could start to slow new construction down. “This is probably the biggest increase in the shortest period of time we’ve seen,” says Scott Fields, owner of Matthews and Fields Lumber in Henrietta. …About 1/3 of it used in homebuilding nationally comes from Canada. “The tariffs have been in place for decades frankly but the current administration raised them to a little over 20-percent,” he adds. …The American consumer is really the one loosing” Fields says. As an example, one train car typically carries enough lumber to build six homes. This time last year, that supply would cost about $60,000. Today, it costs $80,000. For more than three generations, my family has been in the forestry business. …For as long as I have been in this industry, lumber mills and workers across the country have been harmed by the actions of the Canadian government. …This immediately puts my business at a competitive disadvantage not because of product quality, work ethic or technology, but simply because of a government providing handouts to its lumber producers. …People say that duties on lumber imports make it too expensive to purchase a home in the United States. However, the… impact of lumber on home prices is wildly overstated. 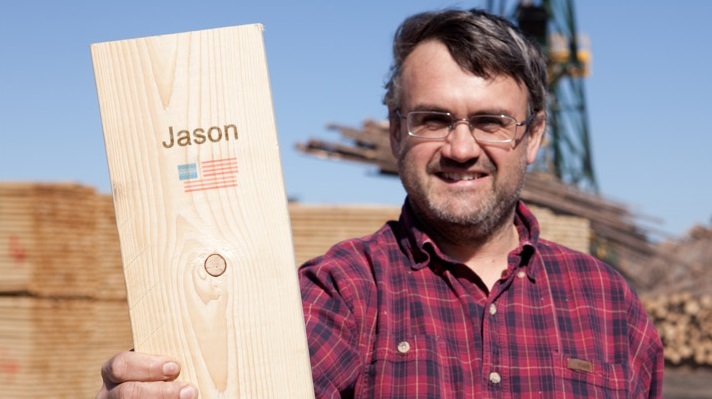 Lumber makes up only about 2 percent of the cost of a new home. …Given a chance to compete on a level playing field, we are seeing that not just our mills, but mills throughout the country rise to the occasion by expanding production to meet the increased demand. 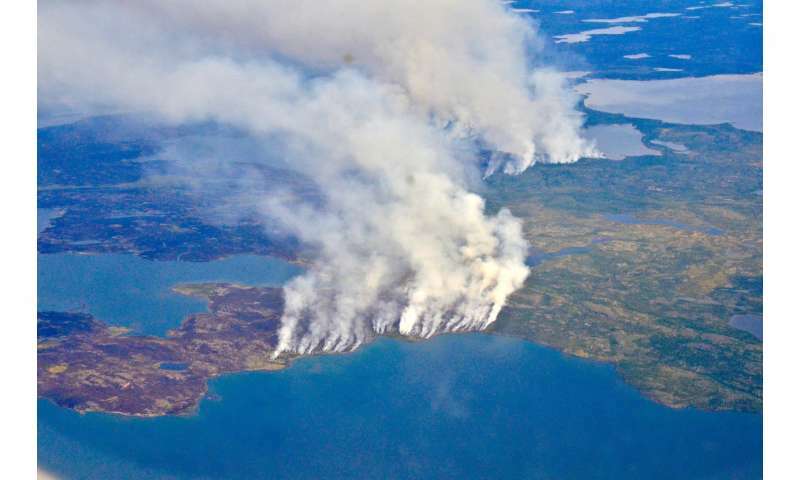 The 2014 megafires in Canada’s Northwest Territories burned 7 million acres of forest, making it one of the most severe fire events in Canadian history. A new study shows that as those fires scorched a region of boreal forest the size of Maryland, they released half as much carbon back into the atmosphere as all the plants, shrubs and trees in Canada typically store in an entire year. The Arctic is warming faster than any other region on Earth, and as it does, environmental scientists expect large fires to increase in frequency and intensity. But they have struggled to understand these fires’ effect on ecosystems and ultimately carbon dioxide levels in the atmosphere. …The megafires paper is one of two recently released studies based on data from NASA’s Arctic Boreal Vulnerability Experiment, or ABoVE. Clearcutting Canada’s boreal forest threatens Indigenous Peoples’ rights, the survival of wildlife like the iconic boreal caribou, and Prime Minister Justin Trudeau’s commitment to combat climate change. The “Amazon of the North” stores more carbon than the world’s tropical forests, locking in more carbon than the world releases in three decades of burning fossil fuels and making its continued existence critical for limiting the worst impacts of climate change. “The significance of Canada’s boreal forest to the survival of the planet cannot be overstated: this ‘Amazon of the North’ is stopping a global climate bomb,” said Anthony Swift, Canada Project Director for NRDC. “Yet every year, more than 1 million acres of intact boreal forest are lost to logging, mining, and oil and gas. Fish are an important part of the environmental, economic, social, cultural and spiritual fabric of BC. People care deeply about fish and fish habitats and how they are managed. Much of the public’s concern about fish relates to how forestry and range activities are managed to prevent impacts to fish habitats. The Forest and Range Practices Act (FRPA) and its regulations contain several objectives and practice requirements to protect or conserve fish and fish habitats. This report will focus on the BC government’s approach to the management of fish habitat, with an emphasis on forestry practices under FRPA. The Sunshine Coast Community Forest will go forward with a board that includes several new faces after the July 23 annual general meeting of Sechelt Community Projects Incorporated (SCPI). …interim chair Geoff Craig was confirmed as chair for a two-year term. …Peter Moonen also will continue with the board. …Glen Bonderud, who resigned as chair at the end of May, wrote the chair’s message for the SCPI annual report. “2018 is a big year for change for the management of the Community Forest,” he wrote. …Ross Muirhead, also from ELF … claimed [he met local sawmillers who] weren’t able to access Community Forest lumber. SCPI operations manager Dave Lasser challenged that claim [saying it was] related to the mill’s operations… “It was not anywhere near the picture you just heard from Ross,” he said. Craig and … Bob Sitter, past CEO of Interfor, defended the use of a broker to manage sales. Effective July 25, 2018, the allowable annual cut for Western Forest Products’ Tree Farm Licence 37 is 847,000 cubic metres. This new cut level includes a partition, so that no more than 770,200 cubic metres per year can be harvested from areas suitable for ground-based harvesting systems. “After reviewing all of the factors involved, consulting with First Nations and considering information provided by the licensee, I am satisfied that the new allowable annual cut reflects government’s objectives for all forest resources within Tree Farm Licence 37, and will sustain the timber supply over the next 10 years,” said Shane Berg, deputy chief forester. The cut level is about a 5% reduction from the previous allowable annual cut of 889,415 cubic metres set in 2009, when 18,351 hectares were removed from Tree Farm Licence 37 to form a portion of the Pacific Timber Supply Area. 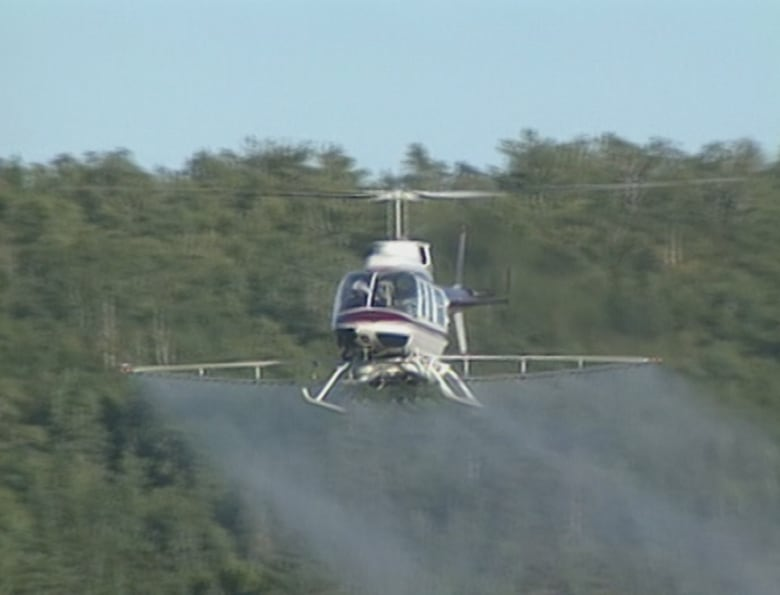 The provincial government did not issue a permit to spray the controversial herbicide glyphosate this year near the Turtle Creek Watershed, the water source for greater Moncton. The decision comes after an outcry from Moncton Mayor Dawn Arnold last August. ‘Well, I’m pretty excited,” Arnold said after learning the news over the weekend. The mayor has been pushing the province to disallow spraying near the reservoir, which provides drinking water to 100,000 residents in Moncton, Dieppe and Riverview. Arnold said the city learned in late August 2017 that J.D. Irving Ltd. would be using glyphosate near the watershed, located 10 kilometres southwest of Moncton. Government spokesperson Shawn Berry said the spray was not necessary. MEDFORD, Ore. — Fire agencies are doing what they can to contain the dozens of wildfires burning throughout the western states. But with so many to handle, there’s really no perfect plan of attack. Northwest lawmakers have been putting out a call to thin out our forests. In May Oregon Senator Jeff Merkley led legislation to extend the Farm Bill and double it’s funding, alongside Idaho Senator Mike Crapo. …Sen. Merkley told NBC5 News he believes thinning is the best strategy to reduce wildfire risk, but adds that even with the Farm Bill, not enough is being done. “We need the federal government to invest a lot more resources than they are right now,” Sen. Merkley said. The Swedish Air Force has declared war on a new, homegrown enemy: forest fires. Sweden dispatched two Gripen fighters to bomb forest fires, snuffing out flames with blast waves. …According to The Local-Sweden, a forest fire has been burning in central Sweden for nearly two weeks. The wildfire, burning near Älvdalen, is in a difficult area for firefighters to reach. …The Swedish Air Force launched a flight of Gripen fighter bombers loaded with GBU-49 laser guided bombs. The Gripens dropped one bomb at an altitude of 9,800 feet. The bomb exploded on target, extinguishing flames up to 100 yards from the impact point. How does it work? A sudden change of pressure will blow the flames of a fire off its fuel source, in this case burning trees, brush, and undergrowth. Ontario’s Ministry of Natural Resources and Forestry is investigating whether construction crews building a major wind-turbine project on the eastern shores of Georgian Bay amidst tinder-dry conditions caused a forest fire that is now devouring more than 5,600 hectares of land. The fire started last Wednesday on Henvey Inlet First Nation at the site of the province’s largest wind project, where crews are blasting rock and clearing land to erect dozens of wind turbines. Despite “extreme fire hazard” conditions and a region-wide fire ban, a number of workers say crews continued to blast rock and use heavy machinery that had set off several small fires earlier last week. A fast-moving wildfire — believed to have been sparked by arson — tore through trees, burned five homes and forced evacuation orders for an entire forest town as California sweltered under a heat wave and battled ferocious fires at both ends of the state. The Cranston Fire, which erupted Wednesday in the San Jacinto Mountains east of Los Angeles, turned into a wall of flame that torched timber and tinder-dry brush. In a matter of hours it grew to 4,700 acres. It was threatening an estimated 600 homes, authorities said. The fire was the largest of at least five that police believe were purposely set Wednesday by a man whose car was reportedly spotted at the starting point of the blaze in Riverside County, officials said. …The fire in the San Bernardino National Forest sent up a cloud 50,000 feet high that was so enormous it created its own weather in the form of lightning. Despite hot, dry conditions, wildland fire crews wrangled 18 percent containment in the Garner Complex, which reached 19,944 acres Wednesday, fire officials said. 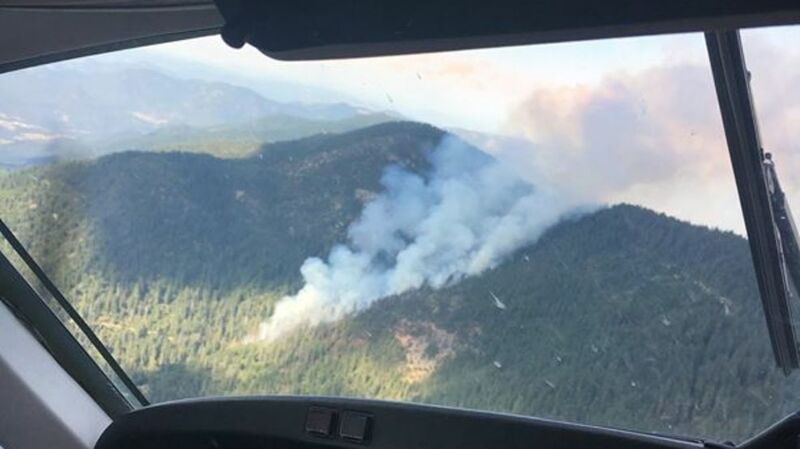 The complex declared a conflagration by the governor last week comprises fires started by lightning on July 15 in northwest Jackson County and portions of Josephine and Douglas counties. 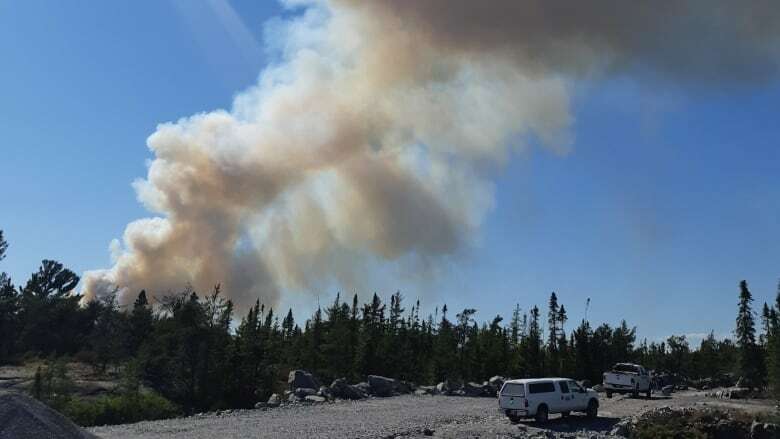 It had grown by 2,575 acres in the past 24 hours, but some of that was intentional, according to a release issued by the Incident Fire Management team. Fires set within control lines to clear out fuels before they can threaten structures will create smoke and flames visible at night, the team said. Control lines are holding in a remote area of northwestern Jackson County, allowing reduced evacuation levels for addresses on the Graves Creek Road north of Ditch Creek. Homes burned as a fast-moving wildfire forced an entire Southern California mountain town to evacuate Wednesday, while tourists emptied from the heart of Yosemite National Park so firefighters could battle a growing blaze nearby. Authorities ordered residents to leave Idyllwild, home to about 12,000 people, and surrounding forest communities in the San Jacinto Mountains east of Los Angeles. At least four homes burned as crews used aircraft to attack the flames that quickly burned nearly 5 square miles of dry brush and timber in inaccessible terrain. No injuries were reported. Officers detained a motorist for questioning after people called 911 to report a suspicious vehicle near the fire’s starting point in Riverside County, the California Highway Patrol said. …Greece was in mourning Wednesday as the number of casualties from the deadliest forest fires in a decade continued to climb past 80. The fires hit areas east and west of the capital, Athens, with the holiday resort village of Mati hardest hit. 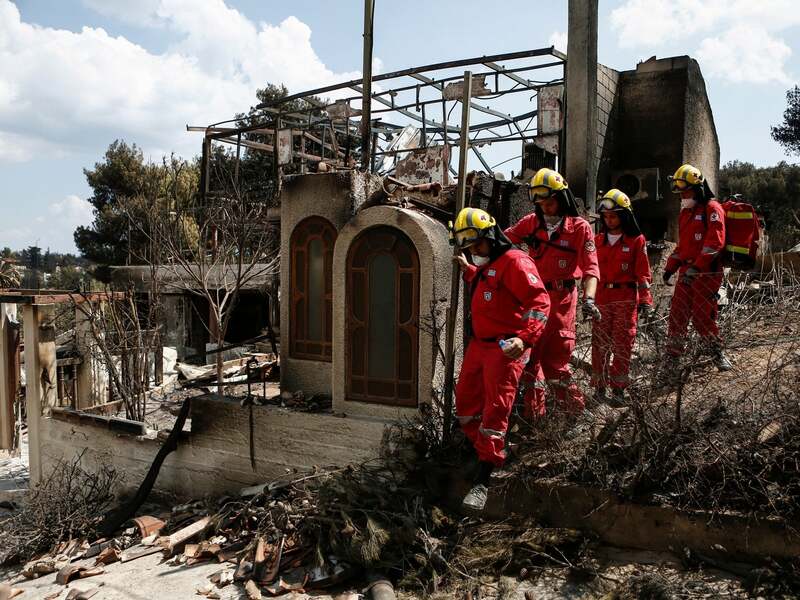 More than 280 firefighters were still in the area to the northeast of Athens in the wider Rafina area, dousing the remaining flames to prevent flare-ups. A further 200 firefighters, backed up by a water-dropping helicopter, were tackling the second forest fire west of the capital, near Agioi Theodoroi… Although there is no formal count, more than 150 people were still believed to be missing nationally as of Wednesday evening, according to Mr Forinakis. …Forest fires are not uncommon in Greece… However, officials have hinted at foul play, suggesting that arsonists may have started the fires in order to loot abandoned homes. Should Germany be scared of forest fires? Temperatures are soaring in Germany this week, with parts of the country surpassing a sizzling 35 degrees Wednesday. Does the heat put Germany at risk of forest fires such as the ones which have recently broken out in Sweden and Greece? …”In Germany, the average temperature has already risen by 1.4 degrees since the industrial revolution,” said PIK climate impact researcher Fred Hattermann. Because of a higher base temperature, heat waves such as the one this week are now even more extreme, he says. …”The risk of forest fires in Germany is extremely high, and we urgently need rain to reduce it,” said Hartmut Ziebs, president of the German Fire Brigade Association (DFV), told DPA. The third annual Biomass North Forum will take place Oct. 16-18 at the Valhalla Inn in Thunder Bay. Dubbed Mapping Canada’s Bioeconomy: Drivers, Roadblocks and Bridges, the event will examine how government, industry, academia and communities throughout the country are navigating towards a sustainable bioeconomy future. A bioeconomy centres on using renewable biological resources to produce food, energy and other value-added products, resulting in innovation, job creation, and economic development. Sustainability is a key tenet of the ideology. The three-day event will include guest speakers, workshops, industry tours, a tradeshow, technology demonstrations, and networking opportunities. It will be capped off by an awards gala recognizing leaders in the bioeconomy. Registration information available on Eventbrite. Welcome to the August edition of Forest Safety News, covering news about safety topics in forestry. Highlights from the August news include: Building a world-class safe pellet industry; Chair of Wood Pellet Association of Canada safety committee encourages increased collaboration; TimberWest contractors receive safety leadership awards; Free Vancouver Island Safety Conference on September 29, 2018 in Nanaimo; Recent incident investigation, Joint Health and Safety Committee and supervisor sessions held at Tl’azt’en First Nation; Injury rate data now available for 2017 – forest industry continues to make positive progress; Keeping cool and knowing when it’s too hot to work! ; and First Woss forestry fundamentals program successfully completed. Read all these stories and more in the newsletter. The BC Coroners Service has ruled the death of a motorcyclist who was killed in a logging truck incident in Whistler in fall 2013 was accidental. But the investigation also found that the logging truck was going 32 kilometres per hour over the speed limit and was 3,570 kilograms overweight. Hugh Craig Roberts, 65, was riding his motorcycle northbound on Highway 99 … when a southbound logging truck lost its load into the northbound lanes. …A Trucking Advisory Group (TAG) was developed as a response to the Roberts accident, as well as a number of other rollovers around the province, said Rob Moonen, CEO of the BC Forest Safety Council (BCFSC), the organization responsible for the TAG. …”One of the things we look to is the number of high-profile roll-overs,” said Moonen. “In 2013, we had 51 in the province, and in 2017 that number is 15.” The goal, he said, is to bring that number to zero.